in a relaxing and friendly environment. We use only the very best products including the natural professional range from KAESO which are paraben, sulphate and mineral oil FREE. Our experienced therapists are friendly and highly qualified- you can relax knowing you are in professional hands. 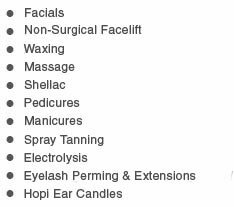 Click here to see our latest beauty offers.